Franciscan theologian; known as the Seraphic Doctor. Born in Tuscany in 1221, Giovanni Fidanza, in consequence of a miraculous cure-entered the Franciscan Order. St. Bonaventure, known as “the seraphic doctor,” was born at Bagnorea in Tuscany, in 1221. He received the name of Bonaventure in consequence of an exclamation of St. Francis of Assisi, when, in response to the pleading of the child’s mother, the saint prayed for John’s recovery from a dangerous illness, and, foreseeing the future greatness of the little John, cried out “O Buona ventura”- O good fortune! At the age of twenty-two St. Bonaventure entered the Franciscan Order. Having made his vows, he was sent to Paris to complete his studies under the celebrated doctor Alexander of Hales, an Englishman and a Franciscan. After the latter’s death he continued his course under his successor, John of Rochelle. In Paris he became the intimate friend of the great St. Thomas Aquinas. He received the degree of Doctor, together with St. Thomas Aquinas, ceding to his friend against the latter’s inclination, the honor of having it first conferred upon him. Like St. Thomas Aquinas, he enjoyed the friendship of the holy King, St. Louis. Appointed minister general of his order in 1257 at the age of thirty-five he restored a perfect calm where peace had been disturbed by internal dissensions. ; guided by his wise and prudent spirit, the Franciscan Order was saved from the schism which was about to divide the rigorous from the mild. He was closely united to St. Thomas Aquinas; both taught at the University of Paris at the same time. Bonaventure did much for his Order and composed The Life of St. Francis. He also assisted at the translation of the relics of St. Anthony of Padua. He was nominated Archbishop of York by Pope Clement IV, but he begged not to be forced to accept that dignity. Gregory X obliged him to take upon himself a greater one, that of Cardinal and Bishop of Albano, one of the six suffragan Sees of Rome. Before his death he abdicated his office of General of the Franciscan Order. He died in the following year while he was assisting at the Second Council of Lyons, on July 15, 1274. The Pope and the entire Council took part in his funeral; every priest in the world said Mass for his soul. St. Bonaventure is a true example of the ascetic Franciscan school, which has spread among the people a fervent devotion to the most sacred human nature of the Redeemer. When he writes on the Passion of Our Lord or speaks in praise of the Blessed Virgin, his language grows eloquent and a seraphic ardor glows in his words. Pope Sixtus IV, when he canonized St. Bonaventure in 1482, ordered that the celebration of his feast in the Basilica of the Holy Apostles should be considered as a solemnity of the sacred Apostolic Palace. In later years a church and a monastery were dedicated to this saint on the Palatine. Pope Sixtus V declared him a Doctor of the Church. 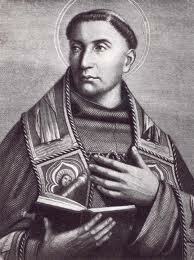 O God, Who didst give blessed Bonaventure to be a minister of everlasting salvation unto Thy people, grant, we beseech Thee, that, as we have had him for our teacher on earth, we may deserve to have him as our intercessor in Heaven. Through our Lord Jesus Christ, Thy Son, Who liveth and reigneth with Thee in the unity of the Holy Ghost, God, Forever and ever. R. Amen. Lesson from the Epistle of blessed Paul the Apostle to Timothy. Dearly beloved, I charge thee before God and Jesus Christ, Who shall judge the living and the dead, by His coming, and His Kingdom. Preach the word: be instant in season: reprove, entreat, rebuke in all patience, and doctrine. For there shall be a time, when they will not endure sound doctrine; but according to their own desires they will heap to themselves teachers, having itching ears, and will indeed turn away their hearing from the truth, but will be turned unto fables. But be thou vigilant, labor in all things, do the work of an evangelist, fulfill thy ministry. Be sober. For I am even now ready to be sacrificed; and the time of my dissolution is at hand. I have fought a good fight, I have finished my course, I have kept the Faith. As to the rest, there is laid up for me a crown of justice, which the Lord, the just Judge, will render to me in that day; and not only to me, but to them also that love His coming. The mouth of the just man shall meditate wisdom, and his tongue shall speak judgment. V. The law of his God is in his heart; and his steps shall not be supplanted. Alleluia, alleluia. V. (Ps. 109: 4) The Lord hath sworn, and He will not repent. Thou art a priest for ever according to the order of Melchisedech. Alleluia. I have found David My servant; with My holy oil I have anointed him; for My hand shall help him and My arm shall strengthen him. Sanctify, O Lord, the gifts dedicated to Thee, and by the intercession of blessed Bonaventure, Thy bishop, look upon them with approval. Through our Lord Jesus Christ Thy Son our Lord, Who liveth and reigneth with Thee in the unity of the Holy Ghost, one God Forever and ever. R. Amen. A faithful and wise steward, whom the Lord set over His family; to give them their measure of wheat in due season. May this communion, O Lord, purge us of guilt, and, by the intercession of blessed Bonaventure, Thy bishop, may it make us sharers of the Heavenly healing. Through the Lord Jesus Christ, Thy Son, Who liveth and reigneth with Thee in the unity of the Holy Ghost, one God For ever and ever. R. Amen.